Synopsis: Ferris Bueller meets La Femme Nikita in this funny, action-packed young adult novel. It's prom night--and Perry just wants to stick to his own plan and finally play a muchanticipated gig with his band in the Big Apple. But when his mother makes him take Gobija Zaksauskas--their quiet, geeky Lithuanian exchange student--to the prom, he never expects that his ordinary high school guy life will soon turn on its head. Perry finds that Gobi is on a mission, and Perry has no other choice but to go along for a reckless ride through Manhattan's concrete grid with a trained assassin in Dad's red Jag. Infused with capers, car chases, heists, hits, henchmen, and even a bear fight, this story mixes romance, comedy, and tragedy in a true teen coming-of-age adventure--and it's not over until it's "au revoir." Any book that has the words “crazy”, “European” and “chick” in the title is sure to attract the attention of any teenage boy- and why not? Au Revoir, Crazy European Chick is, after all, a classic testosterone fueled joy ride of flashy clubs, grimy basements and thugs in large, anonymous black hummers: more than enough to get anyone excited who enjoys unflinchingly brutal and whirlwind novels. Perry’s story is told in short chapters that are titled after college (or university) essay questions- sentences such as “Courage has been described as ‘grace under pressure’. How would you describe it? (Ohio State University)” and “Describe how a specific place can be used to illustrate your personality. (Harvard)” more than anything, these ironic chapter titles provide a contrast against the text and they help secure the novel’s foot in reality, which can’t often be said for thriller writers. Au Revior, Crazy European Chick is dominated by two characters- Perry and his Lithuanian exchange student, Gobija. Perry is a clueless seventeen year old, hoping to go to university and living under the administration of a demanding and authoritarian father. Gobi is a meek, geeky, quiet girl spending a year in the US. At least, to begin with- because Perry soon discovers more about himself than ever before as he gets sucked along in the wake of Gobi’s destruction, who is a little more feisty than Perry’s family originally thought. Perry’s voyage of self discovery plays a vital part in fleshing out his character, and it was great to see such a three dimensional character lead a novel of a genre that often stylistically leaves the characters behind. 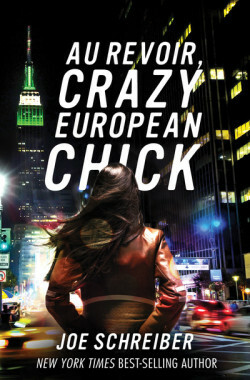 Au Revoir, Crazy European Chick is New York Times bestselling Joe Schreiber’s first YA novel. At around 200 pages long, it’s surprisingly short. And yet, it’s perfectly paced. Actions are described vividly and accurately, a technique that really brings the story to life. Stylistically, it’s almost written like a film- with quick cuts, slow motion and brutal, in-your-face fighting- I can only imagine how much fun a director would have adapting this novel for the big screen. Adult thriller writers often do well on the YA market because they’re not shy to shock. Schreiber is no different- his tale of a night in New York is violent and unpatronising- and yet he is also able to seek out Perry’s story from amongst the rubble and this gives Au Revoir, Crazy European Chick an extra edge: this isn’t just a novel filled with endless action, but a book following characters that matter and feel real to the reader, and that makes all the difference. I don’t care if you hate reading, or don’t feel like it; Au Revoir is short, easy and thoroughly entertaining. What did you think about Au Revoir, Crazy European Chick? Ooh, I agree – this would make SUCH a good film! 😀 I can’t wait for the next one 🙂 Great review!